Three CMs, Three States: All Aboard the Opposition Bus of Unity? The first hop was Jaipur where Ashok Gehlot took the oath for the top job. The next stops were Bhopal and Raipur where Kamal Nath and Bhupesh Baghel kicked off their chief ministerial tenure. New Delhi: The swearing-in ceremonies of three Congress chief ministers – Kamal Nath, Ashok Gehlot, Bhupesh Baghel – on Monday turned into yet another show of opposition unity. Leaders of different political parties, expected to forge an anti-BJP front for the 2019 general elections, participated in the functions. The last such show of strength was seen in the farmers’ agitation in Delhi last month. In a similar display of unity, the opposition leaders, setting aside their differences, attended the oath-taking ceremony of Janata Dal (Secular)’s H.D. Kumaraswamy as the chief minister of Karnataka earlier this year. However, Monday’s show was scaled up in the context of BJP’s losses in all the five states. The opposition leaders travelled together in a bus to catch special flights to make it for back-to-back oath-taking ceremonies in the three states – starting with Rajasthan, followed by Madhya Pradesh and Chhattisgarh. Congress president Rahul Gandhi uploaded photos on Instagram from the bus, calling it “a really special” ride. Travelling together were opposition leaders, Sharad Pawar, N. Chandrababu Naidu, Tejashwi Yadav, M.K. Stalin, Farooq Abdullah, Kanimozhi, Praful Patel, Hemant Soren, Babulal Marandi and Sharad Yadav. Later, Karnataka chief minister H.D. Kumaraswamy and former prime minister H.D Deve Gowda also joined the bandwagon. The first hop was Jaipur where Ashok Gehlot took the oath for the top job while Sachin Pilot sworn-in as his deputy. The next stops were Bhopal and Raipur where Kamal Nath and Bhupesh Baghel kicked off their chief ministerial tenure. Jyotiraditya Scindia and Sachin Pilot, the young leaders who lost out in the race for chief ministership were seen sitting together in the bus. In Chhattisgarh, too, Baghel, T.S. Singhdeo and Tamradhwaj Sahu – all contenders for the top job – projected an united Congress as they sat together in the ceremony. Among the other Congress leaders who were present were former prime minister Manmohan Singh, leader of opposition in the Lok Sabha Mallikarjun Kharge and the uninhibited Navjot Singh Sidhu. But then those missing gained more attention. Trinamool Congress chief Mamata Banerjee, Bahujan Samaj Party’s Mayawati and Samajwadi Party’s Akhilesh Yadav skipped the event. The BSP chief and SP president had also missed the last opposition meet on December 10, giving rise to speculations that the two were uncomfortable allowing the Congress to lead the opposition flock. After the DMK chief Stalin’s declaration that Gandhi should lead the opposition – which the Congress refused tactically at the moment – the absence of the three leaders raised quite a few eyebrows. However, Kamal Nath told reporters that Mayawati has called to congratulate him but could not come as she had pulled a nerve. Banerjee was reportedly busy because of her mother’s death anniversary. She instead sent TMC leader Dinesh Trivedi to the swearing in. Akhilesh had promised to attend, but there was a last-minute change in his plans. The two most important players in the most-populous state, Uttar Pradesh, are keeping their cards pretty close to their chests as they would like to bargain for maximum number of seats out of the 80 members the state sends to the lower house. However, with both Mayawati and Yadav extending their support to the Congress governments in Rajasthan and MP without the grand-old party asking for it signals that they are very much on board. 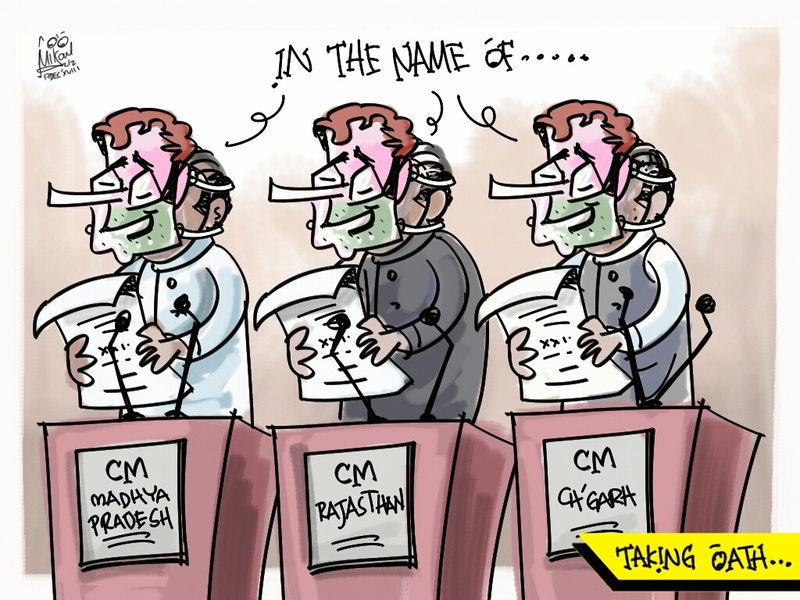 The more noticeable optic of the swearing-in ceremonies were that all the outgoing BJP chief ministers – Vasundhara Raje Scindia, Shivraj Singh Chouhan and Raman Singh – not only attended the functions but were given space on the stage by the Congress. The opposition leaders freely greeted the three, who reciprocated with equal ease. This was a leaf out of Gandhi’s press conference on December 11, the day his party won the three states. Gandhi had taken the opportunity to thank the outgoing chief ministers in a manner of courtesy, while training guns at the prime minister Narendra Modi. Gandhi’s decision to have the outgoing chief ministers on the stage looks like an attempt to challenge Modi-Shah’s dominance over the political discourse, as it has only encouraged hate against political rivals. As the three chief ministers start their tenure, this was a day well-begun when civility took over the bitter political enmity, even though only for a moment.